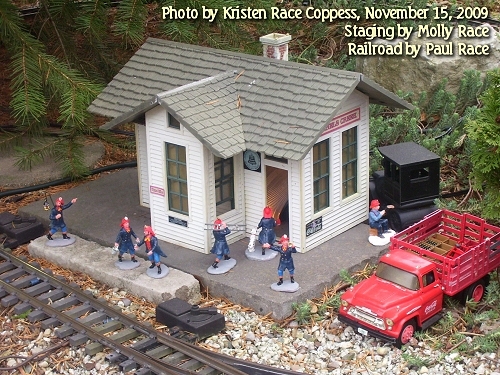 Planning for this open railroad started in early October, when I got a phone call from Nick Folger, who was scheduling open railroads to coincide with November's NMRA train show. I was out of town when I got the call, which only gave us about three and a half weeks to get things going. Fortunately, I had run trains in the summer of 2009, so I knew I wouldn't have to do any major rebuilds like I did in 2008. We were also blessed by ideal weather - an early frost that brought down the leaves so I could get raking "out of the way," followed by several relatively warm weekends. I "blogged" about that in early November. Having done this before gave us ideas for things that worked out well and things that could have worked better. As it turned out, this year's open house was "bigger and better" than last year's but if we'd started off this big in 2008, it would probably have been a disaster. We had a nice stream of visitors, who didn't stay long once it got dark, because it also turned bitterly cold. That was disappointing, because with all the lights, the most "magical" time for a Christmas-themed open railroad IS after dark. There were no activities for the kids besides watching the trains, which meant that those not hypnotized by that soon got bored. Thomas going in circles did not hold the kids' attention for long - if I wanted kids to watch Thomas for more than a few minutes, I would need to give him more "room to run." Freight trains running in darkness are invisible, except for the locomotive and caboose - the only trains that held folks' interest after dark were passenger trains with lit coaches. 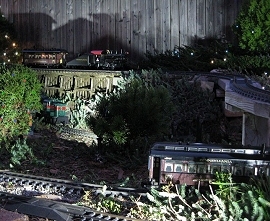 Although most of my buildings were lit, and the tree lighting helped, much of the railroad was essentially invisible once it got dark. Having Christmas music playing was nice and added to the "festive" tone of the event, but playing even my favorite Christmas CDs gave uneven results, because the up-tempo songs would be followed by songs that were too quiet to hear. As a result of my "lessons learned," I planned on several additions and "upgrades." 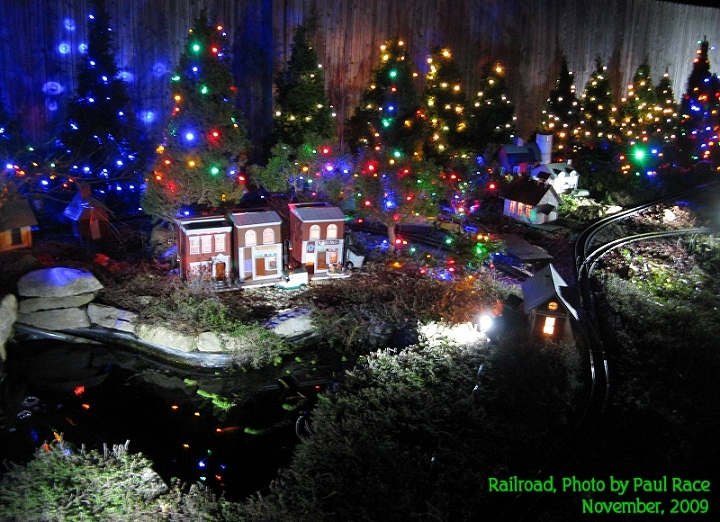 The idea was to host a something more like a "holiday event" that featured the railroad rather than just an "open railroad" with colored lights and music. Of course, I soon bit off more than I could really choo, er chew. So the next thing I did was make a mental list of priorities. The trains had to run. There had to be lights on the trees. 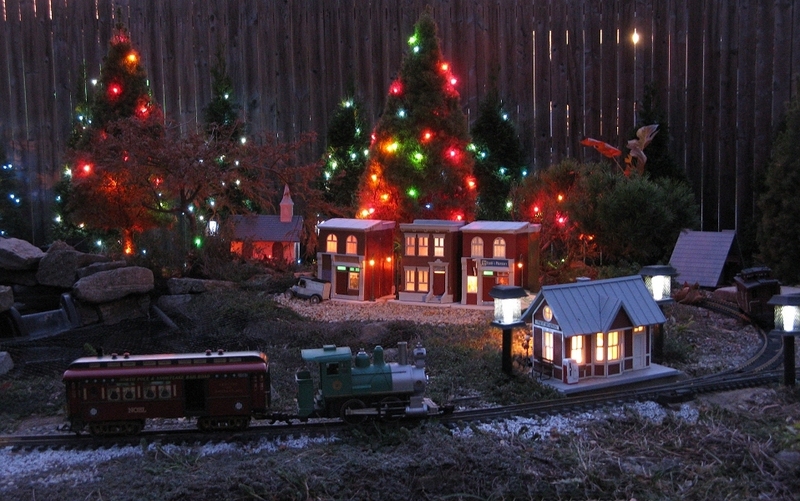 I wanted the railroad to be decorated for Christmas, as it was last year. There had to be snacks of some kind. Thomas would have more room to run than he did last year on the well cover. Little people (figures) would be set up on the big railroad (I can't leave them set up in the fall because of the leaves). 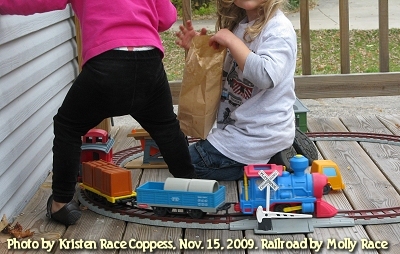 The PlaySkool railroad would be set up for little kids to play with. Interest points on the NB&DC RR would be better lit. The railroad would be re-mulched where wires or mud showed. I went through this "to do" list with the idea that I would work at a reasonable pace, get done what I could, and let the rest go, period. Fortunately I had family help on several of the items on the list. Of course the order of priorities didn't exactly align with the order in which we did things. For example, though we planned from the beginning to have snacks, we couldn't exactly start them three weeks ahead of time. Still, we tried to sequence activities so that the critical stuff would be done for sure, and if any "nice to have" stuff fell off the list at the end, that was okay. Clearing and Cleaning the Track - I took most of one Saturday clearing and cutting back vegetation that had grown over the track, hooking up power supplies and making sure trains would get around the track successfully. I also cleaned the top and inside of each rail, a few minutes' work once the vegetation was under control. (Click here for a new article about cleaning track. Repairing Some Track Pieces - I found that some of my right-of-way had gotten a little "interesting" since the last time I had cleaned the track. The "tie plates" on several of the older pieces of track were no longer holding the rails in place, so I replaced the ties on the worst offenders. In fact, that activity inspired an article on refurbishing garden railroad track. Selecting and Testing Trains I also selected and tested several small locomotives and one-piece units to make certain I would have something running all afternoon, even if an individual piece had a problem. This included an old Lionel Large Scale 0-4-0, an AristoCraft four-wheeled "critter" diesel engine, two AristoCraft 0-4-0s, a Lionel Thomas, a Lionel James, a backup Thomas, a Bachmann street car, and an AristoCraft "Eggliner." By the way, though I always plan to run a variety of trains, the AristoCraft 4-wheeled locomotives are always my backup - they run longer with less attention under less optimum circumstances than any other locomotives I own, which is why I keep accumulating and recommending them. Most of the locomotives listed above were also decorated for Christmas. I had acquired all but one of them used over the last few years, because I had been setting up little Christmas railroads at work, schools, and elsewhere, and I didn't want to risk a major investment. Along with this activity, I looked for illuminated passenger cars that would run on less-than-optimum track. I had some Bachmann coaches that would have worked, but the carbon cylinders in the power pickups had all been worn away, and the screeching was terrible, so I stuck with Aristo this year. 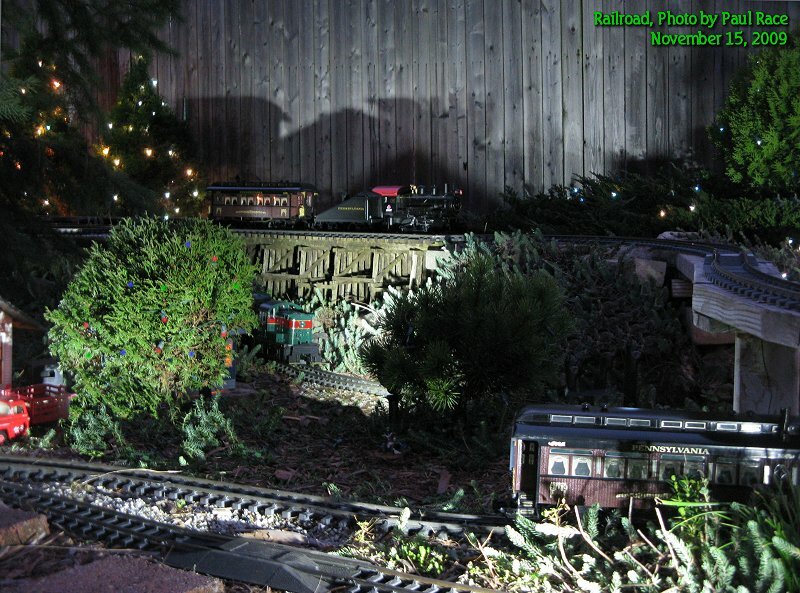 My railroad has a lot of little conifers, in part because I want it to look green 12 months out of the year. For last year's open house, I lit almost all of them using traditional incandescent light strands, almost all of which had been used before, so there was no big investment. But after Christmas, 2008, I had picked up several strands of LED lights. This year, I used those until I ran out, then finished up with the incandescents. After dark, the LEDs looked more like glowing rubies, saphires, and emeralds glowing in my trees than "Christmas lights." A wierd side effect was that they projected little circles of light, so the neighbor's privacy fence behind my trees was pockmarked with blue circles. From some angles, it was hard to tell where the trees were versus where the little blue "spotlights" were hitting the fence. That fence never looked so good, in a festive, Twilight Zone kind of way. I took the photo below from an upstairs window of our house after the last visitor left. This shows the south loop and the middle part of the railroad. You can see the rich colors of the LEDs (toward the center of the photo). You can also see the effects of the spotlights I installed (below) to improve visibility of the railroad's features after dark. About a week before the open house, I set up the oval and little posts I had used to display Thomas in two clinics near Cleveland in 2007. 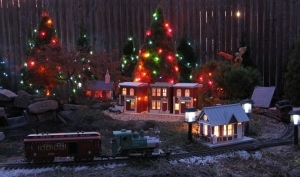 I also added rope lighting, as discussed in our recently published feature article about this little display railroad. The rope lighting on that little railroad, plus the rope lighting I had already installed on my back porch gave the scene a sort of carnival atmosphere. So I got to thinking about carnival-style snacks. And that led me to tracking down a big theater-style popcorn popper I could borrow. 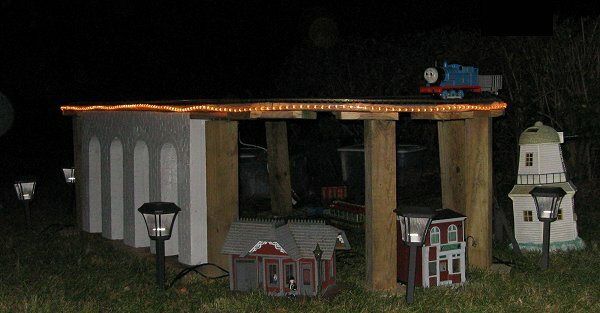 To make Thomas' railroad more visible after dark, I added a few lamps from a 12-volt LED garden lighting set I experimented with this summer. They are pretty bright for garden lighting, so I set them a few inches "out" so they wouldn't cast a bright glare right on the posts. The photo below shows the rope lighting and landscape lights, though I took it with a flash, so you don't get the whole effect. I had other lighting planned for this railroad, but didn't have time to add it. When it was too late to do anything about it, realized that I could have used my old microphone stands to hold spotlights way up in the air and provide better "zone" lighting for Thomas. Once again, the little railroad was a success. And as it turned out, the last child to visit the railroad left well before dark, so lighting wasn't that critical. As of this writing, this little railroad has stood in our yard for an additional three weeks. The viaduct, cheezy as it is up close, is so impressive from a few yards away, that I'm thinking that it would be worth building extensions to go all the way around the railroad. That would make the railroad useful, not only for Thomas, but also for the Polar Express and the Hogwarts Express, which also run over impressive viaducts. 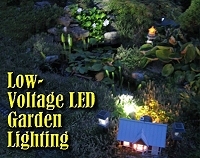 I had already been experimenting with a set of Brinkmann low-voltage LED garden spotlights. Although they were a little cumbersome to set up I thought I'd try using them to light some of the otherwise dark areas of the railroad. Since the open house, I've updated my article on the Brinkmann spotlights to include ways I used them for this. I didn't have time to do everything I wanted with them (like concealing the lights and the cords), but they made several areas of the railroad that had been invisible after dark "come alive." An example is this trestle in the photo to the right. These days the trestle is getting harder even in daylight, thanks to a rapidly-growing but otherwise desirable tree. After dark it's usually invisible period. But with one concealed spotlight, it became an area of interest this year. Other photos of areas lit by the Brinkmann spotlights appear elsewhere in this article. 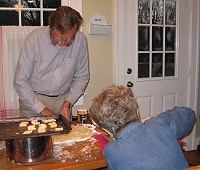 When it looked like most other things were under reasonable control, we set aside one evening to make cookies to go out on the treat table. 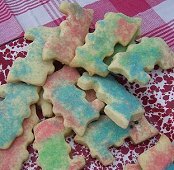 I made the dough and cut out the cookies, and Tess decorated with colored sugar (a task our kids used to do before they fled the nest). We made about eight dozen small train-shaped cookies. Folks weren't shy about taking them, but we still had about four dozen left at the end of the evening, a very nice side benefit. 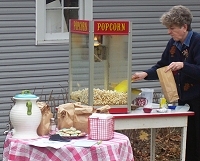 The real hit, however, was the borrowed popcorn machine. We went through several pounds of popcorn, distributing a few dozen lunch bags full, and, as the kid photos show, it was very much appreciated. In addition to supervising the "food services" part of this operation, Shelia also made lemonade, and we had warmer drinks available. The weather was very nice, however, so most people were satisfied with the lemonade. Last year, I wanted to make music an important part of the experience, but it was near the bottom of a very long list of critical items. So that turned into a boom box playing Christmas CDs, which was still better than nothing, believe it or not. This year I wanted to get a "theme-park" sort of effect. I wanted folks watching the railroad to hear songs that were all different styles but consistently upbeat. I started out with a list of songs I "had to have,' for the sound track, and a stack of Christmas albums. Burl Ives' "Holly Jolly Christmas" and Andy Williams "Most Wonderful Time of the Year" topped the list. To that I added the Polar Express theme song, "Its the Spirit of the Season," and two of the instrumentals from the sound track. ("Believe" and "When Christmas Comes To Town" didn't make the list, because they're not all that upbeat.) Then came other upbeat favorites, including Emmy Lou Harris' "Christmas Times a'Comin'," Nat King Cole's "Caroling, Caroling," and so on. As I worked my way through the stack of CDs, I noticed that a lot of my favorite Christmas songs were more devotional in nature, such as Emmy Lou Harris' "The First Noel," Kathy Mattea's "Mary Did You Know," and Bing Crosby's "Do You Hear What I Hear?" Such songs would be out of place accompanying a Christmas train display, but they would be perfect if I ever set up a Nativity outside. Also, many Christmas "standards," such as "Let it Snow," "I'll be Home for Christmas," and "Silver Bells" are not especially upbeat. Still, they have a nostalgia value that brings back good memories for lots of folks. Nostalgic - suitable for general "background" music. Finally I burned a CD of the nostalgic songs and put it into a boom box hidden near the end of our driveway, so folks coming in would get that effect. Then I burned another CD of the upbeat songs, and played it through high-quality portable speakers on the railroad itself. The effect, coupled with running trains, and eventually with the brightly lit trees, really was magical. On the other hand, I only had time to set up a two-speaker system. If I do this again next year, I'll try to set up a system that provides better coverage. If I get a chance I'll post the song lists, with the proviso that I never did get every song I wanted, and that I will try to resort them and get into a better sequence before I use them again. As a final note on the music side of the event, I even toyed with the idea of getting live entertainment, such as paying young friends to play violin or piano "live" for at least part of the afternoon. Live Christmas music outdoors is a very special experience. If I knew we were going to do this next year, and to get bigger crowds, I might be tempted to go that way, and just use the sound tracks during the musicians' "down time." Of course that's a lot of "ifs." Since we moved Thomas to a roomier railroad, our well cover would be open. It is almost table-top flat, so I thought it would be possible to install an O scale railroad on that just to show what else is available. I dug out a bunch of ceramic village houses that I had bought at thrift shops to use in scenery articles for our Big Indoor Trains site. I also dug out one of my On30 trains, a Bachmann set that I also bought mostly for photo sessions and article research, but which runs like a Swiss watch. If I had a Lionel set in working condition, I might have set that out, too, but I didn't think about that early enough to do anything about it. I had a piece of 4'x4' white styrofoam and a bunch of smaller pieces that I thought about using to make a "landscape" for this railroad. But, since I couldn't set up most of it until a day or so before the "big day," I ran out of time, and wound up setting the train and town right on the concrete. 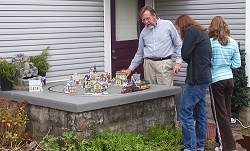 Still, several folks who own ceramic Christmas villages were very glad to see it and to ask questions about On30 trains. It also helped folks put the size of the "big trains" into perspective. When you see Large Scale trains and buildings outside, the size of the setting can trick you into thinking they're about the size of Lionel(r) trains and Dept. 55(r) buiildings. Seeing O scale trains and buildings in the same setting as the Large Scale trains reminds you just how big the "big trains" really are. 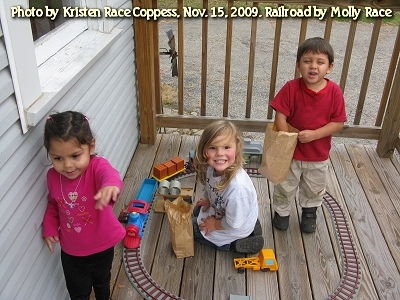 When we prepared for the Christmas-themed open house in 2008, we still had a teenager at home, one who loves setting up the little people and otherwise helping with the railroad. This year she is attending school in Indiana, three hours away. When she heard we were doing this again, though, she begged a ride home so she could help. We were so busy that she couldn't set up all of the people. In fact our "best" figures - the ones she's used to setting up - were still in the box when people started arriving, so they never got out. To keep kids engaged, we brought out our youngest daughter's battery-powered PlaySkool set, the best toy train for little kids ever made, and sadly out of production for about 10 years (sorry). I cleared off a space on our back porch for the train - I figured since the "big people" in our family would be coming and going, they could keep an eye on things. 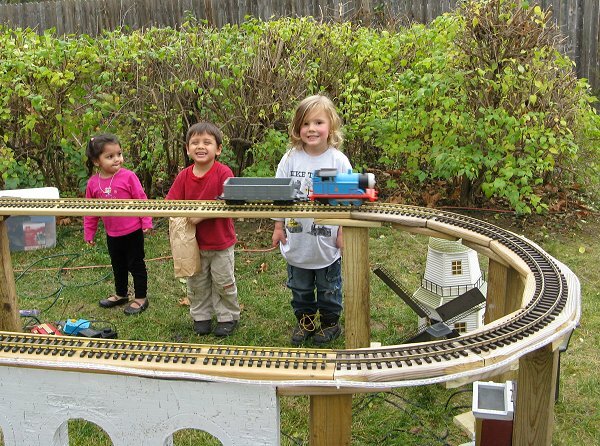 As you click on the photos below, notice the instinctive tendancy of small children to make themselves into bridges for toy trains, a very good reason not to let them get too close to expensive toys. 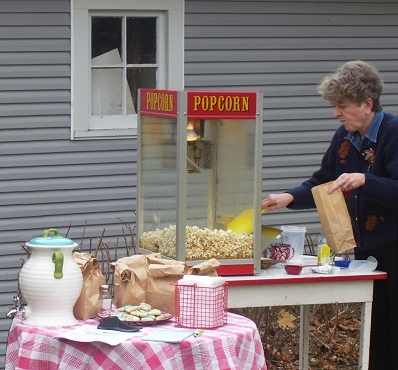 Also, notice the ongoing popularity of the popcorn. During the week before the open house, I investigated several options for providing heat around the railroad in case it was bitterly cold again. Those little raised fire-pit things were one possibility. But I held off on making an investment until I got a good sense of what the weather would be like. As it turned out, it was going to be cloudy, but warm and dry, as good a weather as we could ask for in mid-November. So we dodged a bullet on that score. I had planned to dump mulch everywhere you could see wires running across the railroad. That never happened, but no one seemed to mind too much. We never got all the figures out that we planned to, either. Several other ideas I had toyed with were so far off the grid that they're not worth mentioning here. But the fact is, we got in all of our "have to" list and most of our "would like to" list, with the help of several family members, including Shelia, my sister Tess, my daughter Molly, and even a few visitors who helped with minor things. The end result was a holiday event that most visitors seemed to enjoy very much, although we could have easily accommodated three or four times as many people as we had, hint, hint. 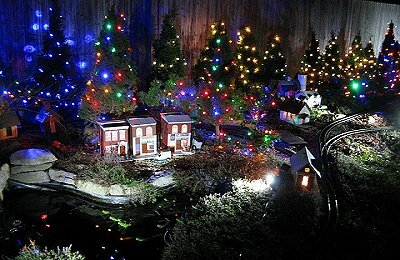 As you've already seen through some of our photos, the real magic on a Christmas-Themed outdoor railroad happens when it gets dark and you can really see the little lights. Here are a few examples of that magic. Click on the photos below to see bigger versions. Guests who were already garden railroaders included Wil and Jeanne Davis, whose railroad was one of our biggest inspirations for years. (Wil's help with reviewing and fact-checking my articles is also invaluable.) More garden railroaders probably could have come except for a scheduling mixup that put our club's monthly meeting the same afternoon and about ninety minutes in the wrong direction. 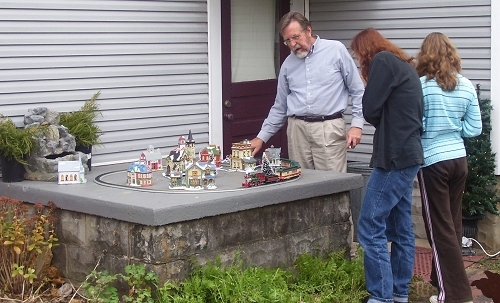 Other model railroader visitors included Nick Folger, the fellow who organizes open houses for the Dayton-area NMRA chapter (National Model Railway Association). Several other friends of the family, mostly from our church or from the Tecumseh school district, also stopped by. Above all, I hope that we injected a little Christmas warmth into each life, and that each reader gets at least some Christmas cheer from seeing our photos. Once again, you may feel that we've provided far more detail about our preparations than we needed to. And you may think we have too many links to other articles. But I thought it would be helpful to see how all these aspects of garden railroading plus preparing for a "holiday event" fit together in context. Like our New Boston and Donnels Creek pages, we wanted to show that even chronically disorganized people can have great garden railroading experiences with a little hard work and willingness to try something new. This is also an object lesson on how getting your railroad ready for visitors will cause you to do improvements and repairs that you might otherwise keep putting off indefinitely. 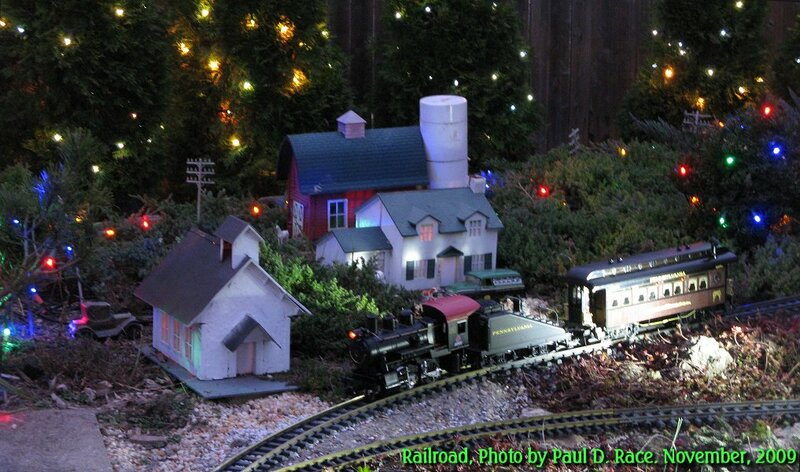 And Christmas music and colored lights aside, much of what we did for this event will have lasting effect on our railroad. Above all, we wanted to give you ideas and encouragement for your own Christmas season, whether it involves trees, trains, cookies, or anything we've mentioned at all. Please accept the Race family's wishes for a joyous Christmas and a blessed New Year! 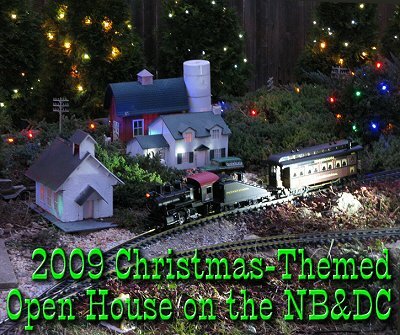 Once again, if you would like to ask questions, be notified of future open houses on the New Boston and Donnels Creek, or learn about other Christmas-themed open houses in Southwest Ohio this year please visit our 2009 Christmas Open Houses sheet. Best of luck, have a great holiday season, enjoy your trains, and especially enjoy any time you have with your family this season. Paul, what a seriously interesting article; I read every word of it . . . . Your coulda/shoulda remarks were edifying, your photos charming (loved the trestle spotlight), and your encouragement inspiring. Just a beautiful effort from start to finish. Kudos!